Apply sparingly to cleansed skin morning and evening. Malus Domestica Fruit Cell Culture Extract, encapsulated in liposome prepared from soy- phospholipids, is Swiss Apple StemCells to protect skin stemcell, protecting longevity of skin stem cells, delaying senescence of essential cells, combating chronological aging and preserving the youthful look and the vitality of your skin. In vivo shows 100% of 20 volunteers subjects aged from 37 to 64 experience anti-wrinkle effect and whitening effect. Rhododendron Ferrugineum Leaf Cell Culture Extract is a plant derived stemcell based on the stem cells of alpine rose leaves, increasing skin stem cell vitality, boosting epidermal regeneration, improves the skin barrier function and helping the skin to cope with climate changes. A clinical study performed during winter confirmed the capacity of this ingredient to reinforce the skin barrier and to reduce aging signs (wrinkles, redness, loss of radiance). Hydrolyzed Pea Protein Stemcell is nano sized, liposomized peptides (~150nm) and stemcell extracted from Pea and helps activate collagen production and proliferation of fibroblast while activating stemcell, inhibiting of collagenase. Oligopeptide-1 is highly effective for anti-aging, epidermal growth factor (EGF) promotion, helps wound heal fast. Herb Extracts works as antioxidant, anti-inflammatory and immunomodulatory effects while these are very effective for atopic dermatitis, seborrhea, skin irritation and whitening. L-Ascorbic Acid is powerful antioxidant with micro-delivery system, encourages collagen production, reverses sun damage, gently lightens hyperpigmentation & age spots Brighten & even out skin tone. Reverse sun damage, lighten age spots, scarring, sun spots & freckles. Rebuild collagen & elastin for firmer, younger looking skin. Refine pore size; "an essential cofactor" for the synthesis of 2 enzymes (Lysylhydroxylase & polyhydroxylase) - which in turn catalyze the production of the amino acids required for producing collagen,the primary connective tissue in skin. Magnesium Ascorbyl Phosphate is a vitamin C derivative that has better stability than abcorbic acid. MAP is often used for: UV protection and repair, collagen production, skin lightening and brightening, and as an anti-inflammatory. It is also a potent antioxidant. Alpha Arbutin (6%): A natural skin lightening/whitening agent. It works by slowly releasing hydroquinone through hydrolysis, which in turn blocks tyrosinase activity and reduces the skin’s melanin (pigmentation) production. 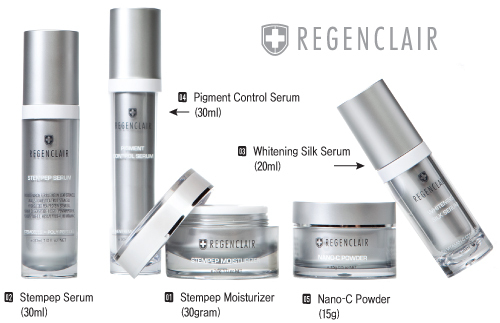 Regenclair Whitening Silk Serum is an exclusive Multi-Vitamin Facial Treatment with Argireline. It contains an essential amount of Vitamin C, just the right concentration of Vitamins A and E, also beneficial minerals, and extra pure essential oils. Hexapep C-Silk helps the skin regain tone, moisture, silkiness and radiance. It provides a smoothing, antioxidant, brightening and protective treatment for all types of non-sensitive environmentally damaged skin starting to show signs of aging. When used prior to makeup, it helps to form a breathable moisture seal and helps to achieve a smooth and even application of makeup. A technologically advanced combination of Vitamin C and Retinol in one formula with phyto-nutrients and DNA building blocks to promote younger-looking skin and encourage a healthy glow. Helps visibly increase tone and firmness by reinforcing skin's essential function. As its name suggests the skin is left silky smooth to the touch. A small amount goes a long way. 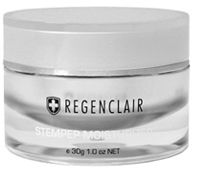 Before moisturizing, apply 1-2 pumps morning and night. The key ingredient is a scientific breakthrough. The exclusive patent, bioengineered compound is a newly discovered pentapeptide (Arginine, Lysine, Aspartic Acid, Phenylalanine, Alanine) that also contains rare plant extracts including Mushroom, Licorice, Bearberry and Lactobacillus Algae – which have been bioengineered into powerful penetrating micro-beads that work within the skin to transform dark melanin (emumelanin) into lighter melanin (phaeomelanin), depressing synthesis of the melanocytes that cause hyperpigmentation. Formulated with an exclusive skin lightening compound, PentaPeptide, that achieves amazing results without the most common and potentially irritating skin bleaching agent, hydroquinone. Rare plant extracts in micro-bead form work within the skin to transform dark melanin (emumelanin) into lighter melanin (phaeomelanin), depressing synthesis of the melanocytes that cause hyperpigmentation. Apply entire Pigment Remodeling Essence to the targeted area amount directly onto where aging spot, intercelluar melasma, post-laser hyperpigmentation, laser induced erythema, inflammation, free radical generation, wound healing and non-laser related pigmentation problems seen in daily practice exists. Pigment Remodeling Essence can be used twice a day to achieve optimal results rapidly. At morning, wash your face with a cleanser. Apply a thin coat of Pigment Remodeling Essence over the treated area. After 30 minutes, apply an SPF of 15 or greater. Apply cosmetics normally. At night, wash your face. Apply a thin coat of Pigment Remodeling Essence over area to be treated. If using other products such as tretinoin or alpha hydroxy acid, apply these products first and wait 30 minutes before applying Pigment Remodeling Essence. This new Vitamin C Powder with 25% Peptide C Complex from iLab, is the very latest in anti-aging skin care. Recent scientific research has shown that vitamin C is a potent antioxidant that is capable of preventing and even reversing the effects of aging on human skin. It is for this reason that we use vitamin C as a key ingredient in our anti-aging formulations. If topically applied, a high-dose of vitamin C serum would also help prevent and treat dry skin problems. We have formulated a stable and unique Vitamin C Skin Serum that does not degrade rapidly like other vitamin C preparations may. 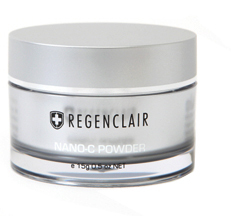 Nano-C is designed to counteract time, the environment, and the forces that are harmful to your complexion. At the same time, it protects from future damage by promoting cell renewal, boosting collagen production and providing antioxidant protection. Before moisturizing, mix 1-2 spoonful of powder with Pigment Serum and apply lightely to the face.